If you happen to be in the market for a Viking statue, then this is the ideal place to search. 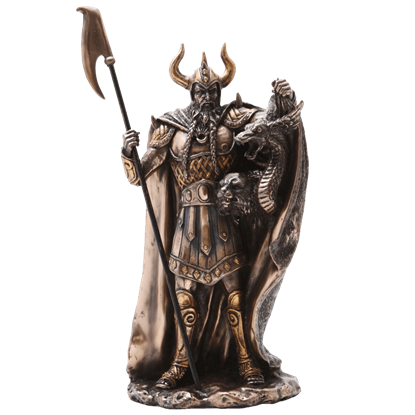 Offering a wide array of distinctive designs, our Viking sculptures depict some of the most popular figures in Viking culture, such as Odin, Valkyries, Thor, Tyr, Frigga, Loki, Freya, Fenrir, Baldur, Heimdall, and others. 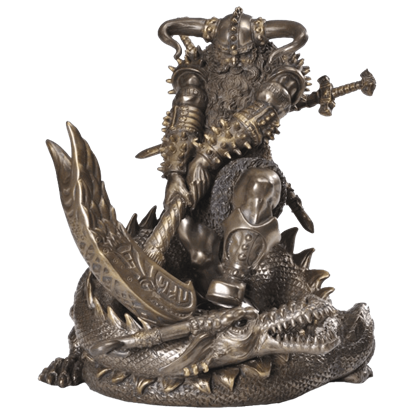 Some of our Norse statues depict famous scenes from Viking mythology, including titanic struggles between heroic figures and monstrous beasts, while others are simple depictions and Viking busts of the Norse gods and their divine servants. Of course, no series of Viking statues would be complete if we did not include an actual Viking here and there, engaging in some heroic act of combat or skill. 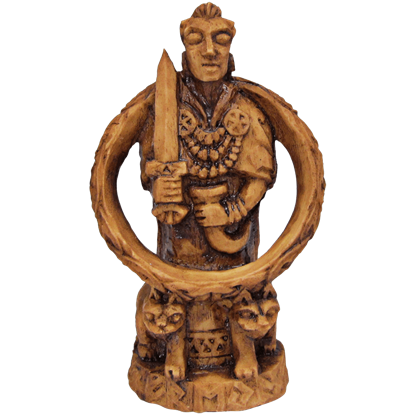 These Viking figurines are fantastic decorations and great gifts. Each one is tastefully detailed, and they come in a variety of sizes to suit the space you have available. Browse our selection, and you will find the perfect piece of Viking decor for your home! In Norse mythology, Ragnarok is the last battle that reduces the world to ash. During the battle, Thor is fated to fight his greatest enemy, the world serpent Jormungandr. This epic battle is depicted in the Battling Thor Statue. The Bronze Loki Statue depicts the complex god from ancient Norse mythology with two of his most fearsome children. Often viewed as a trickster and a villain, Loki is here shown armed with a halberd and dressed in full armour. A huntress goddess and giantess with a fierce independence streak, Skadi was happiest bowhunting in the mountains. 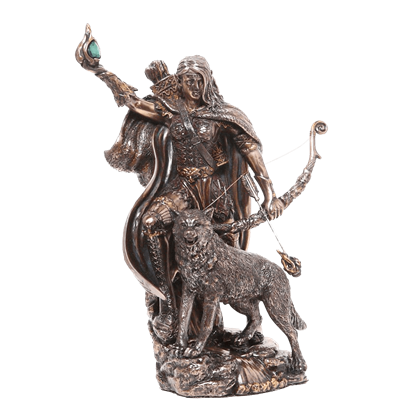 This Bronze Skadi Goddess of Winter Statue depicts her hunting on skiis with two wolf companions. Norse divinities are divided into several different categories, and one such grouping is the jotunn. 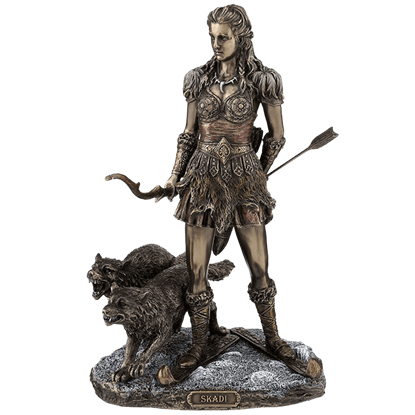 These nature spirits are often regarded as enemies, but some, like the one depicted in the Bronze Skadi Statue, are gods. There is not a more well-known Norse god than Thor, the god of lightning, thunder, and strength. 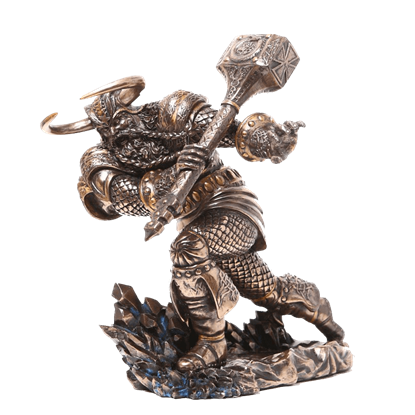 In the Bronze Thor Attacks Statue, this famous son of Odin charges across the ground, swinging his mighty hammer in a wide arc. The Norse god of thunder kneels on the battlefield ground, preparing to strike any unwary foes. 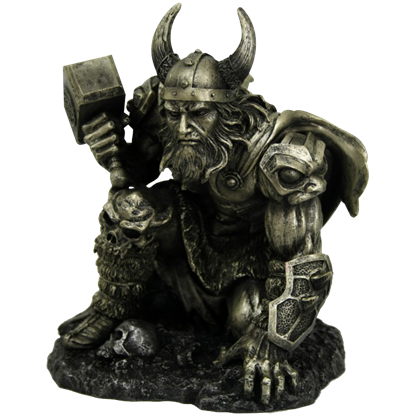 The Crouching Thor Statue depicts the Viking deity Thor in impressive, realistic detail, hand finished for an antique sculpture effect. Taking up sword and shield rather than bearing children, shieldmaidens exist within history and legend as some of the most well-known female warriors. 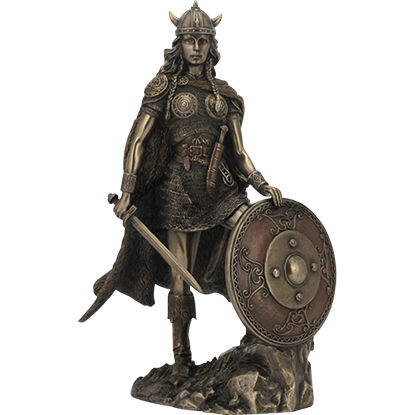 The Female Viking Warrior Statue depicts one such figure in her armor. 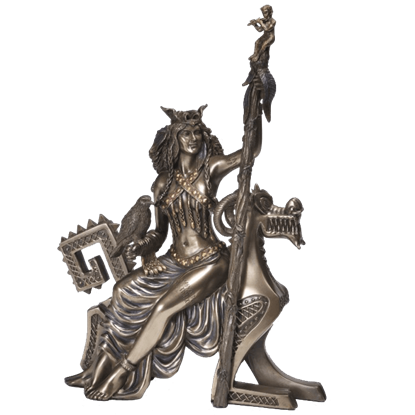 The Freya Goddess of Love and War Statue depicts the beautiful Norse god in lovely folklore style detail. Crafted to resemble a classic wood grain carving with bold detail, Freya is illustrated by iconic sword, hawk wing cloak, and cats. 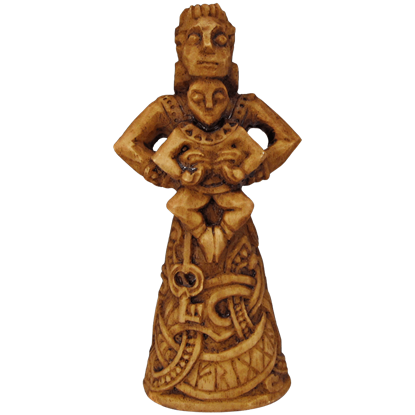 Our Frigga Goddess of the Hearth Statue is a traditional interpretation of Norse artwork. Frigga, Odins wife, represents home and family by the child embraced in her arms and the key hanging from her waist in this unique statue. As queen of the gods and wife to Odin, Frigga was the foremost of goddesses in Norse mythology. In the Frigga Statue, she is depicted as a beautiful woman who wields a staff and sits atop a strange, beast-like statue as a throne. In Norse myth, few figures are as vilified as Loki, the Norse god of fire and trickery. Loki was shapeshifter, too, so his true form was rarely seen. 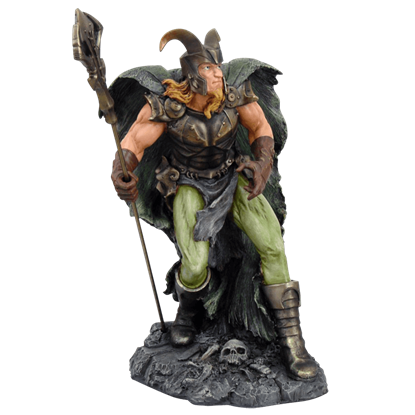 But the Full Color Loki Statue reveals his warrior form in impressive detail. The Vikings are well-known for their fearlessness in battle. 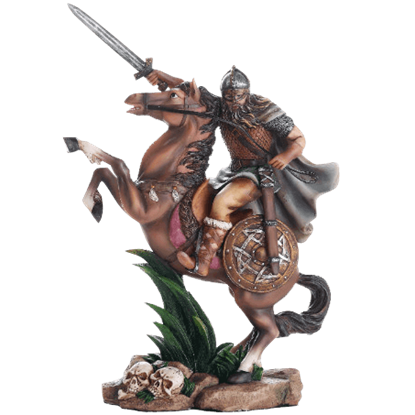 This Full Color Mounted Viking Warrior Statue perfectly captures the essence of a valiant Viking warrior heading into battle on the back of his trusty equine companion.